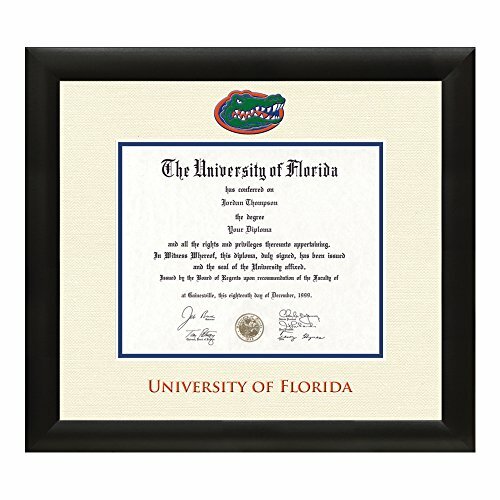 Proudly showcase your hard-earned diploma in our University of Florida Diploma Frame. Our dimensional printing technology is an industry exclusive and gives the logo and University of Florida school name a unique "raised" profile that actually stands out from the textured ivory and blue matting! This made-to-order custom frame, which features our stylish Tacoma moulding, is handcrafted in the USA. Our industry-exclusive dimensional color process makes the official UF name and Gator logo pop! If you have any questions about this product by Church Hill Classics, contact us by completing and submitting the form below. If you are looking for a specif part number, please include it with your message.